What's a Monster to do? Let's face it! Monsters arehorribly misunderstood...They're just trying to get along, just like everybodyelse. Trying to find a place in the world, make friends, find jobs, fun thingsto do. Monsters have hopes and dreams, you know. SO WHY ALL THE SCREAMING?Everytime we see a monster-WWWHHHHAAAAAAAHHHH! Get over it! Sit down and playa game of MONSTER-OPOLY and get to know these lovable mugs! Collect monsterfriends, increase your rents with a Scream. This is a game that could changethe world! Monsters and humans UNITE! Why can't we all just get along? 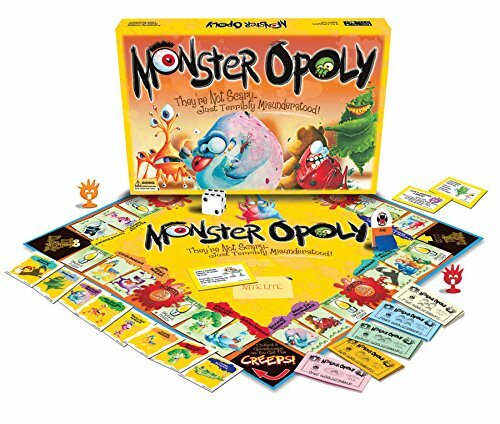 Fromthe Manufacturer Property trading game for kids about fun monsters.